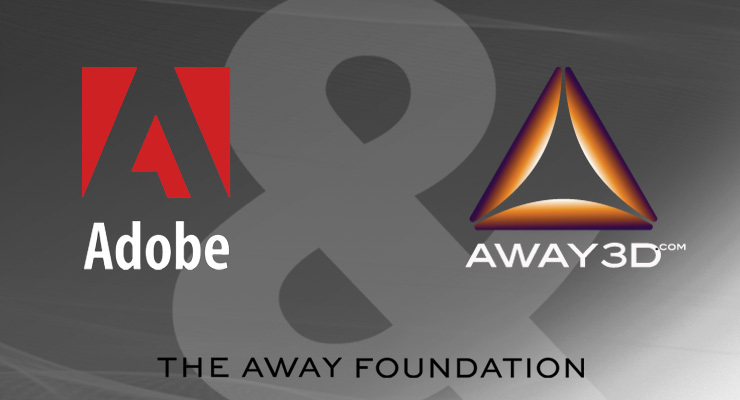 We are pleased to announce Adobe Systems as our first official funding partner of Away3D, and an Away Foundation Strategic Member! Read an in depth interview article about the precise nature and setup of The Away Foundation over at http://blogs.adobe.com/digitalmedia/?p=4904, or continue reading here for a description of what this development will mean for Away3D users. Over the past few months, the work of the Away3D core team and community has generated significant interest from the Flash Product Team at Adobe. As Adobe's gaming focus for Flash gathers pace, the proliferation of free and open source libraries designed to enable content developers in this new era of Flash development becomes an important catalyst for the establishment of workflows and growth of communities that use Adobe Flash and Adobe AIR platforms for professional work. Away3D has long been about free software resources with a strong open source philosophy, and long-term survival has been achieved by independent production contracts that leverage the Away3D APIs. These days, the software managed by the core team is split across multiple frameworks, languages and platforms, and our user base has exploded to proportions that no longer realistically bear the tag 'side project'. While we are overwhelmed by the support and encouragement given by other developers, we are now in a position where stable, continued growth requires an established funding scheme to allow team members the opportunity to focus their efforts entirely on Away3D matters, without having the distraction of external (and potentially unrelated) contract work. As a result, a new non-profit organisation has been formed called The Away Foundation. The primary role of this company is the continued management, funding and development of the free and open source software resources under its control, with focus on improving production workflows and end-user experience for graphics-based games and applications, on the web and mobile devices. The Away3D engine is currently the most significant software resource managed by The Away Foundation, and many other related resources such as the AWD format, Away Physics and Prefab3D will be included in The Away Foundation's resources remit. These supporting libraries carry their own communities and development teams, and we hope to be able to make significant improvements to these resource areas as well as Away3D itself in the coming months. Adobe play a pivotal part in the setup of The Away Foundation, as they have agreed to a Strategic Membership role with a funding commitment that will enable a level of development and support for continuing work on Away3D, allowing core members to focus their commitment to library development and the community support of those industry professionals who rely on our reosources. Furthermore, Adobe have announced that they are committed to a supporting role in the Away3D community itself, citing Away3D as their 3D framework of choice for the creation and publishing of 3D content via Adobe Flash on the web and Adobe AIR on mobile devices, and dedicating time and resources to Away3D concerns. As always, we will be continuing to encourage community involvement in the ongoing development work around Away3D and associated libraries, something that gives us an unparalleled edge when it comes to feature updates, integration opportunities with other resources and support material both official and third-party driven. Our core team and committer tier will remain unchanged in its approach to code contributions, and we hope that with the added focus brought by The Away Foundation, we can pay more attention to collaborative efforts that come out of the community, and involve ourselves in potential new avenues of exploration and collaboration for future API enhancements. You can find out more on the goals and principals of The Away Foundation by visiting http://www.theawayfoundation.org and clicking on "About". Nice to hear some good news about Flash it's rare these days. Wow, that's really good news in lot's of ways.